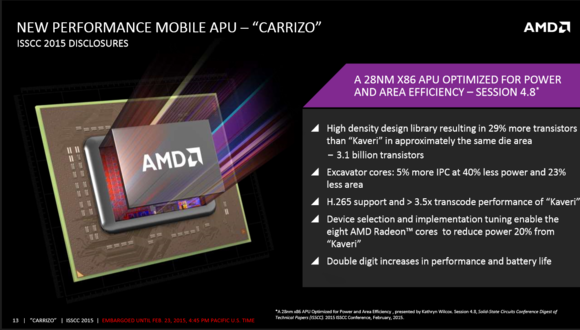 In January, AMD said that its upcoming Carrizo chip for notebooks and low-power desktops would cut power significantly over the prior generation, Kaveri. On Monday, AMD explained how. AMD still isn’t disclosing what the actual power consumption or the performance of the Carrizo chip will be. But the manufacturer offered some breadcrumbs, creating a trail forward to when those disclosures will actually take place. AMD claims that Carrizo will offer double-digit improvements in performance and battery life compared to Kaveri, which AMD positioned as competitive to Intel’s midrange Core i5 chips in January 2014. But while AMD certainly isn’t discounting the performance of the chip, extending the battery life of the notebooks that use it seems to be its primary design goal. A summary of AMD’s Carrizo disclosures. That’s significant, as both Kaveri and Carrizo are both based on a 28-nm manufacturing process. 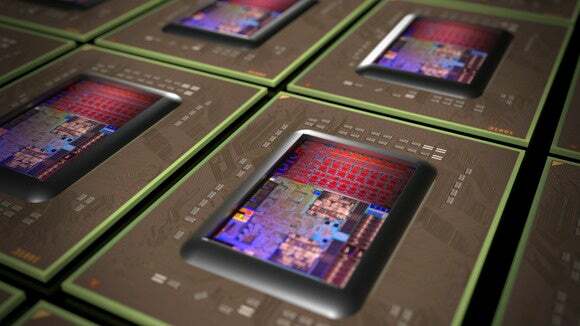 AMD also said that the eight Radeon cores consume 20 percent less power than Kaveri, as well. Again, AMD hasn’t released information regarding the combined performance or power consumption of the Kaveri chip as a whole. The power savings are due to three tweaks: optimizing the voltage of the chip, responsible for cutting power by 10 percent on the CPU and 19 percent on the GPU; and adaptive voltage. A third, simply tuning the GPU portion for low power, saved an additional 20 percent in the power used by the graphics elements versus Kaveri, AMD said. The voltage optimizations eliminated the need to overcompensate for unexpected voltage drops in the chip, known as “droop”. Droop is essentially wasted power, AMD executives explained. A second technique, known as adaptive voltage and frequency scaling (AVFS), also includes proprietary speed sensors, shich allows each APU to “adapt” to its own environment, and scale power accordingly—up to 30 percent. Carrizo will be fully HSA 1.0 compliant, meaning that it will deliver on the Heterogenous Systems Architecture that AMD has talked about for some time. With HSA, the GPU can also be tapped to perform compute functions, which the company claims will deliver far more performance than the speed increases from moving to finer CPU manufacturing technologies alone. AMD has also integrated an ARM security processor, which AMD calls AMD Secure Processor. HSA integration will help the chip reach 3.5 times the transcode performance of Kaveri, AMD said. It will support H.265 video encoding. Rival Intel and a number of other chip makers will also speak at the ISSCC, which has increasingly catered to not only microprocessors but the embedded controllers and bus technologies that complement them and keep them fed with data. Intel, for its part, said it was confident that Moore’s Law, the guiding principle of the semiconductor industry, would continue on track for at least two more generations of manufacturing technology. Why this matters: While it’s unclear what the final power consumption and performance of the Carrizo chip will be, it seems apparent that AMD believes that each of these power-saving techniques will contribute substantially to reducing the overall power. In speaking with Naffziger, it’s obvious that AMD will continue to pursue its strategy of what might be called “design judo,” using design techniques to overcome the manufacturing clout of its rival Intel. The real question will be the balance of performance per watt: will Carrizo’s performance be good enough that customers will prize its low power consumption? Or will Carrizo be seen as a low-end, inexpensive chip?